Have you noticed the embroidered jeans trend that’s being going on in recent years? I have wanted to try this for so long but have been hesitant to try a lot of the embroidery positioning that I’ve seen. I think to make this feature work you need to be careful not to go overboard. 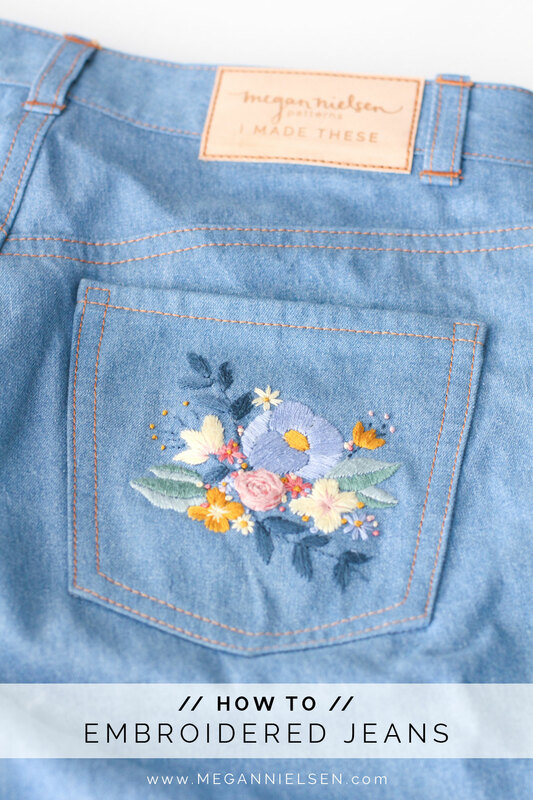 I decided on embroidering one back pocket, the idea being that it’s enough to be a feature and is also a removable part of my jeans so if i get sick of it I can easily remove the pocket and sew a new one on. This is a great option if you are worried about fully committing to embroidering your handmade jeans. I thought I’d walk you through the process I used and a few tricks I figured out along the way and some suggestions for where to find great embroidery designs! Hello friends! 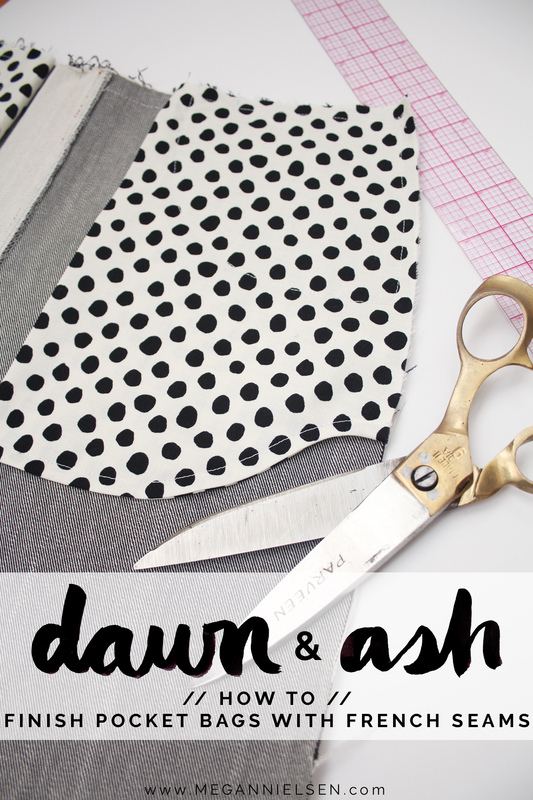 I have a fun little bonus tutorial for you today that works for both the Dawn and Ash jeans. There were quite a few requests for tips on how to get a cleaner finish on the pocket bags. 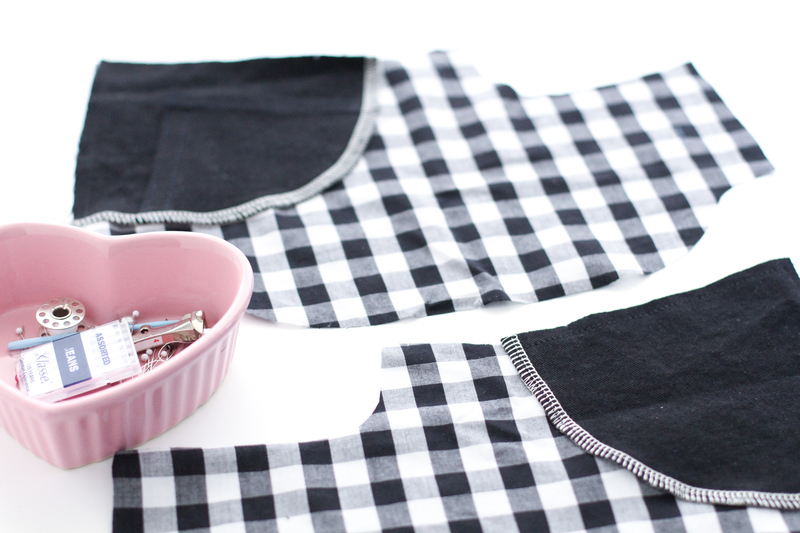 So today we’re going to go over how to finish those bottom edges with french seams! If you’ve ever sewn any kind of french seam, this is the same exact concept. It’s going to create a pretty and clean finish along the edge, where the raw edge of the fabric is complete enclosed. It gives a nice little professional looking touch. Are you ready to see what I mean? Let’s get to it! You know I try to be really honest about my sewing mistakes, so I feel I must tell you this little cautionary tale about always paying attention to the stretch percentage of your denim. You may have noticed that when I suggest stretch denims for the Ash jeans I not only recommend a fabric content to look for, but also to always test the stretch percentage before you sew to make sure it stretches enough – regardless of whether the fabric content seems right. That’s because I learnt the hard way that the percentage of spandex/lycra/elastane doesn’t necessarily equate to the appropriate level of stretchiness across denims. 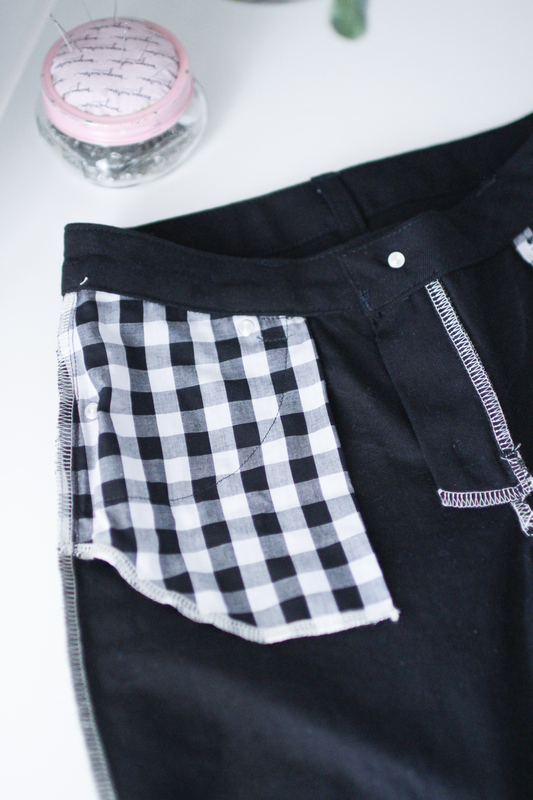 I have been on the hunt for the perfect pair of black skinny jeans for quite some time, so while i was developing the Ash jeans it seemed like the perfect opportunity to make some. 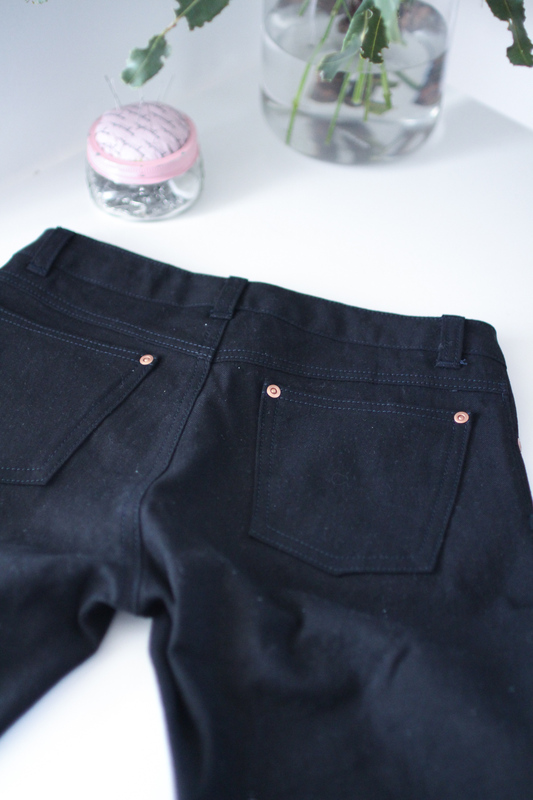 I ordered a beautiful black denim from MRecht that had 2% spandex, and just started sewing. I had already sewn a lot of Ash jeans at this point, and a lot of denim from MRecht so i didn’t both baste fitting, and didn’t bother checking the stretch percentage of the fabric, nothing. I just finished the whole pair, down to rivets and possibly the best topstitching i’ve ever done. I went to put them on and… couldn’t get them past my thighs. Is there anything worse than the feeling when you get stuck halfway into trying something that doesn’t fit? At that point i realised something horrible had gone wrong. I went back to the pattern, yup I cut the correct size. I checked the specs and the finished garment measurements were right. Only then did i check the stretch percentage. It was less than 5%. I wouldn’t even class that as a stretch denim. I made an entire pair of jeans in fabric with stretch content and they didn’t stretch enough. I was devastated. This epic failure taught me to pay careful attention to stretch percentage – and I’ve found that stretch percentage across denims with the exact same percentage of spandex/lycra/elastane can vary wildly! I always think that a mistake is worth it if you learn from it – so here is a lesson I learnt the hard way so that you don’t have to – always ALWAYS check the stretch percentage of your denim before you sew with it, even if the content is appropriate for a stretch denim. If you need some help calculating stretch percentage, you can always check out this post and download our stretch percentage ruler. While I was developing and testing the Ash jeans I became pretty obsessed with finding different ways to customize my denim. When you start buying denim to make jeans it becomes pretty apparent that there isn’t a huge amount of variation in colour and finish. Don’t get me wrong, I love indigo, but I don’t want all my jeans to look exactly the same. Today I’ll give you a few ideas and tips for distressing and fading your own denim, using items you very likely already have at home! Here we are! The very last step in your jeans construction! 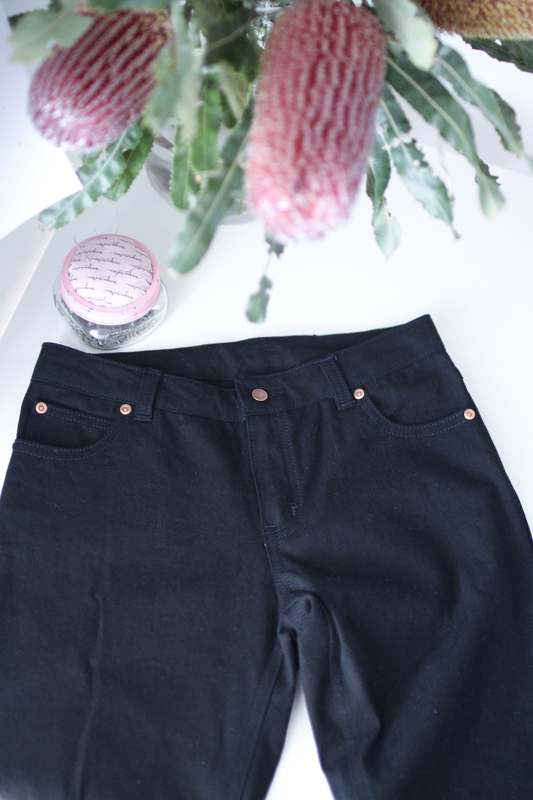 I’ve used the Ash Jeans for this tutorial, but the Dawn jeans follow exactly the same steps! So, raise your hand if one of the reasons you’ve been afraid to make your first pair of jeans is because of installing rivets and buttons. I hear ya – after the fly, I thought this was going to be the scariest part of making my jeans. But to my surprise, it was actually super simple! You can do it with some basic tools. And as long as you practice a couple times first (make sure to get a few extra rivets and buttons! ), you’ll have no problem installing these little details. For the button you’ll need: a scrap piece of wood, or a wood cutting board. For the rivets you’ll need: a scrap piece of metal (steel or iron), the back of a frying pan, or a small anvil. For both the button and anvil you’ll need: an awl or something to poke holes through denim (like a nail), metal/wire cutters, and a hammer. There are some other ways to install rivets, and I’ll go over them quickly at the end of this post. But first I’ll go through the basic installation, without needing any extra equipment. Ready? Because here we go!